These are the desserts that I made for the Oasis Farm ideas supper at Waterloo on Wednesday. They were really, really delicious. Excuse the poor image! 400ml blood orange juice – around 7-8 oranges. Melt the sugar in the orange juice by heating and stirring – do not boil. Soften the gelatine in a bowl of cold water until supple. Take the orange juice off the heat and stir in the gelatine until dissolved. Sieve the mixture and then pour about 2cm into small glass bowls, wine glasses or ramekins – whatever you are serving them in. Place in the fridge to set for 2 hours. Heat up the double cream and sugar on a low heat while stirring in a sauce pan. Bring it to the boil, then turn the heat down and let it simmer for 2 minutes. Take off the heat and add in the lemon juice and zest and stir very thoroughly. Leave to cool slightly for 15 minutes. 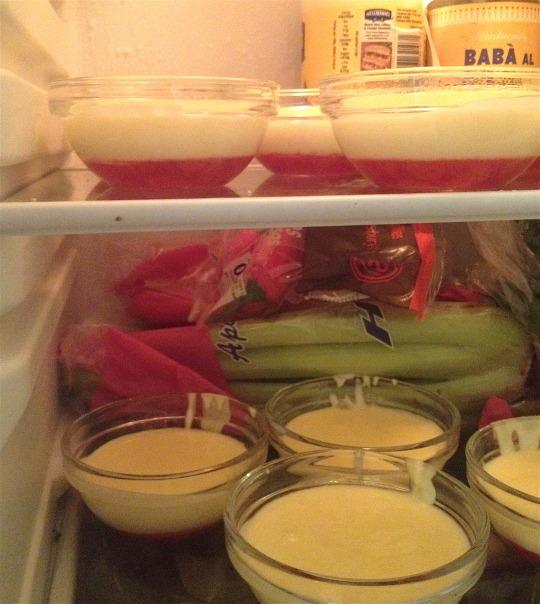 Then remove the set jellies from the fridge and gently spoon around 3-4cm of the posset mixture over the top. And leave to cool completely in a cold place in the house, then place in the fridge. When ready to eat, top with toasted, flaked almonds.